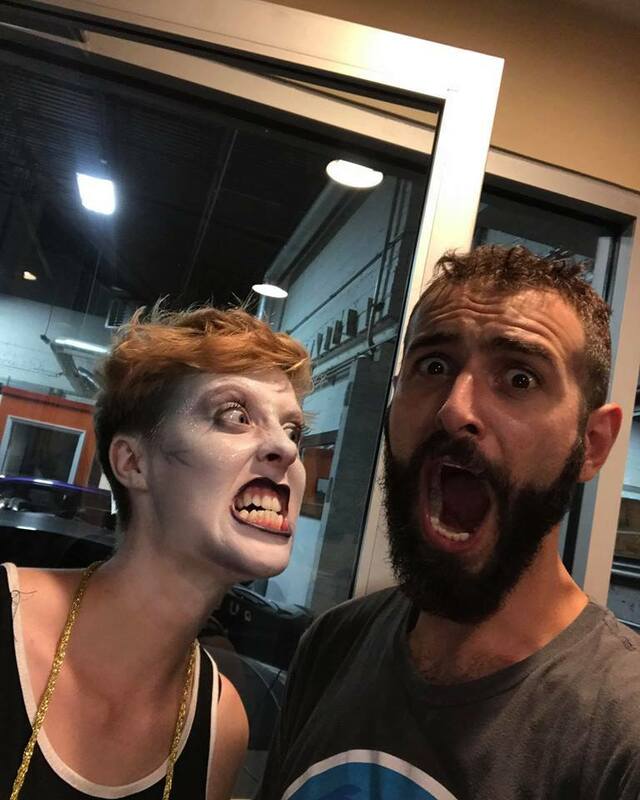 Writers Molly Pease and Ash Barker Make Us Consider a Dietary Change with "Eat Rich"
Eat Rich is a comedy-horror narrative about Rose, a trans femme zombie who nourishes herself via a ravenous diet of cisgendered, hetero-males, written by multi-talented partners Molly Pease and Ash Barker. 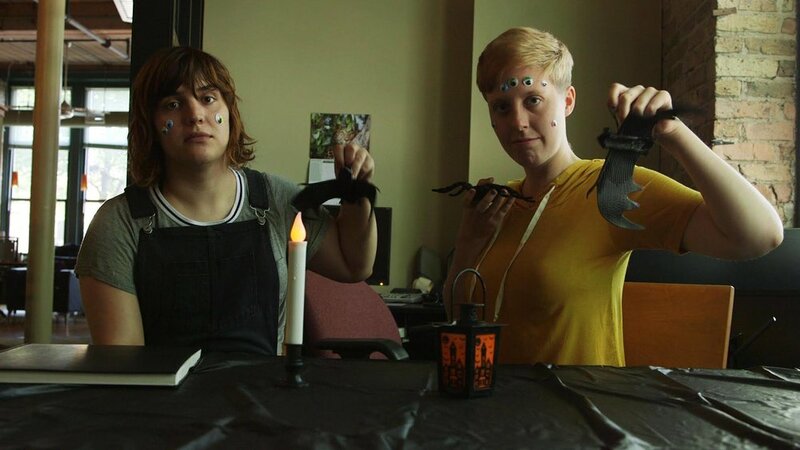 Molly is a graduate of Northwestern University’s film school and Ash is a singer-songwriter and web-comic artist, who together additionally combine their brilliance into a podcast called Queer4Queer. A four-panel comic drawn by Barker, found on the short film’s Facebook page encapsulates the synopsis: Rose, Emily and Rich are tethered together for a night in which the question is pondered: should Rose eat Rich, a straight, cis-het male? The title of the short firmly answers the question. 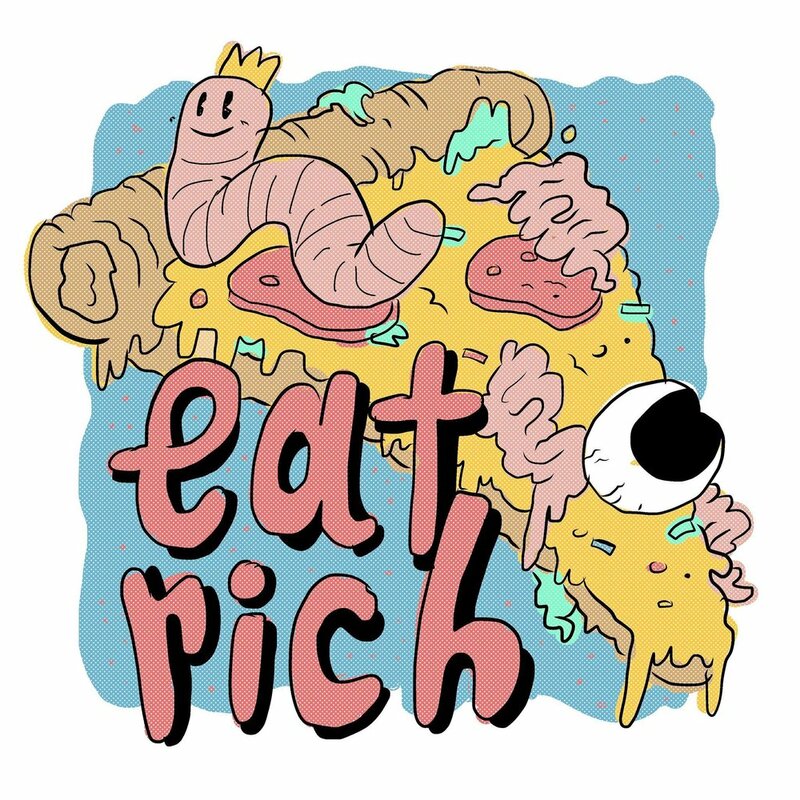 Eat Rich is a comedy-horror, undoubtedly, but the driving force behind its creation is earnest, dire and in need of attention. Molly and I sat down in front of our respective electronics to discuss the film content, further inspirations, funding and inner dynamics of Ash’s and their relationship. Paul: Hi, Molly. I’m glad I was fortunate to interview you for this project. Eat Rich is incredibly novel in its approach, someting so bold and necessary and does its work through a blended comedy-horror form and stunning animation. What were some of the initial inspirations for the film and its conception? Molly: So many things inspired this idea! My partner and I created the story together. We were inspired by the trope of the queer/trans character who never survives the film or tv show almost regardless of genre and the real life homicides of trans women that happen at a devastating rate in 2018. Basically, we wanted to bring back the trans woman who dies in a film and actually give her a voice and immortal power. That's powerful. Initially, I can see how horror fits into the frame of this story, but how did comedy come into play? Well, I've always been a comedy writer. Most of my scripts are about taking a ridiculous situation and playing it out realistically which is naturally funny. My partner and I also both strive to make queer art that is more light hearted and funny since it can often be dramatic and dark (which ours is too but not til the end). Also I always feel bad for queer actors for having to play all those dramatic roles and I wanna give them a chance to be funny! That makes complete sense. I think often when marginalized, oppressed folks do get representation in media it's repeatedly shown in a tragic, one-dimensional light and I think it's important to turn that trope on its head. What other troubling themes does Eat Rich tackle in response to queer community and representation? Exactly! And dramatic realism can be done well, but is not what I'm ultimately gonna have fun watching on a queer date night. Probably the most important theme is how boring straight people are & how queer people always somehow get roped into doing their emotional labor. Great answer, haha. What has the filmmaking process been like in terms of shooting, funding, etc? You’re throwing a dance party for funding? Yes, we’re excited for the dance party! Getting together the crew and cast has been great. We finalized our cast this weekend and am super excited to be working with an all LGBTQ cast! They were all our top picks for Chicago actors, and I feel really excited to work with them! And our crew is a mix of my friends from Northwestern film school and some new people I've met in the queer community. We don't start shooting til after we’re finished fundraising in October. The fundraising is daunting but we’re taking it one day at a time & hopefully we'll get a big turn out at our dance party! We also have an amazing drag performer who's doing make up for the film & the party! I'm super stoked to have them on board. Did you go into film school knowing you wanted to share queer narratives through comedy? My partner runs a trans nerd web comic called Fake Gamer Girl which has gotten a ton of awesome support! We also do a podcast together called Queer4Queer and we’re overwhelmed at how quickly a kind & supportive community has shown up for those projects. Those projects gave us the confidence to try and make this film! And yes I did want to write queer stuff going into NU! But I didn't realize how much I’d write about being a Southern queer which is like a whole different species to Midwesterners. Haha you're originally from GA, right? What differences do you notice? Yeah, I grew up outside of Atlanta and I feel like one difference is I'm a lot louder with my opinions in a "Bless your heart way." Midwesterns are actually passive aggressive, Southerners are actively aggressive. My partner is also from Kentucky but we met in Chicago. I understand "Bless your heart” all too well. Who do you have in mind in terms of the Eat Rich’s audience? Are you wanting people to come in with some awareness or have this be a 101? For audience, obviously we want to make something that will be entertaining for everyone to watch. But awareness is always a funny thing to think about as a writer cause people have Google haha. It’s more, “Do I want them to be aware before or 10 secs after the film?” But the biggest thing is we didn't want Eat Rich to feel like a standard Trans 101 film where we have to explain everything. We want this to be something that a trans audience can actually enjoy and not just a lesson for the cis audience. How would you describe Ash’s drawing style? Ash’s drawing style is very cute & original. All of the art for our project is being done by them! Do you both share a similar sense of humor? I can imagine that facilitated the writing process. Yes, we definitely do! She's been asking me fake interview questions through most of this to try to get me to laugh. Haha, what was one of the questions? My favorite so far: "How do you #Hooligan?" Eat Rich is an LBGTQ-inclusive and centered comedy-horror film in production. You can donate to its creation at Barker and Pease’s Indiegogo found here.